Get ready to see San Fernando like you’ve never seen it before! The San Fernando Street Festival on March 31 will close more than three miles of streets to vehicular traffic and open those roads for residents and visitors to walk, run, bike, skate and more. The Festival will run from 9:30 a.m. to 2 p.m. The route runs through the heart of San Fernando along San Fernando Road, Maclay Avenue, San Fernando Mission Boulevard and Brand Boulevard and will showcase food trucks, a bicycle skills workshop and live music from the likes of La Sonora Dinamita and Mariachi Lluvia y Fuego. Local merchants and restaurants will showcase their wares in the storefronts along Maclay and San Fernando. 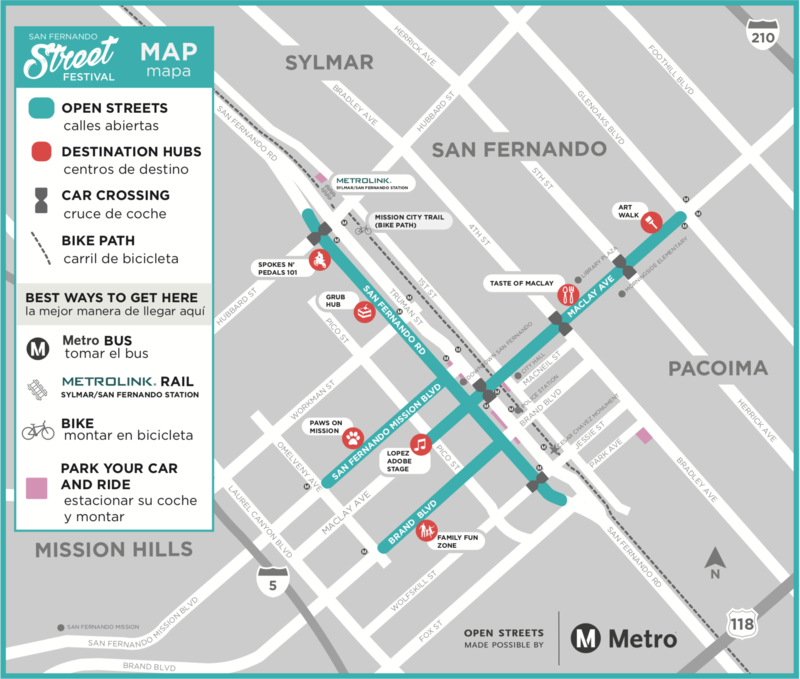 The San Fernando Street Festival is funded through the Metro Open Street Grant Program, an initiative aimed at encouraging sustainable transportation and letting Angelenos explore the possibilities of car-free streets. Metro hopes that the event will help residents reimagine the future of transportation in Los Angeles County. Located in the center of San Fernando, the Street Festival is easy for locals to reach by foot or bike. If you’re interested in biking from farther away, the Los Angeles County Bicycle Coalition will be leading feeder rides from North Hollywood and Cal State Northridge. Prefer to take the train? The Metrolink Sylmar/San Fernando Station is conveniently located near the festival. Check the schedule for the Antelope Valley Line and remember that you are allowed to bring your bike on Metrolink trains. You can also take Metro buses – check out our Trip Planner for the best routes. Be mindful that space on bike racks is limited. Metro planners and staff will be at the Spokes-n-Peddles Hub handing out informational materials and answering any burning questions you have on the Metro projects and programs. We look forward to seeing you in San Fernando later this month for another amazing Open Streets event! What’s your vision for development at the future Little Tokyo/Arts District Station? Cool an open streets event that is on a Saturday. That is good for all of the church going people that miss out on Sunday events.